Gymnema sylvestre, also known as Gurmar, Meshasringi and Cherukurinja, is popular as “sugar destroyer”. The leaves of the plant are dried and pounded together with coriander fruit, and then the juice is extracted to be given orally for remedying diabetes. In India, the herb is primarily being used to treat type II diabetes. Pterocarpus Marsupium, also known as Indian Kino, Malabar Kino, Pitasara, Venga, is a large deciduous tree, which commonly grows in western and southern parts of India and Sri Lanka. It has demonstrated ability to reduce the absorption of glucose from the gastrointestinal tract. It is also known to improve insulin and pro-insulin levels. One can expect a reduction in the blood sugar level within 10-15 days by taking this and it is normally taken as a course for 3 months.Normally we don’t ask the patients to stop their existing allopathic medication immediately . Patients can take it along with the existing allopathic medicines they are taking right now. After checking their blood sugar level after 10-15 days they can slowly reduce the dosage of the existing allopathy medication they have been taking all these years and gradually can stop the allopathic medicine within a short period of time. We provide it with the name Gluco care. It is one of the finest medicine without any side effect to regulate blood sugar level. 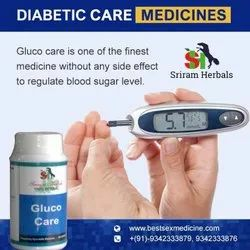 One can expect a reduction in the blood sugar level within 10-15 days by taking this and it is normally taken as a course for 3 months.Normally we don’t ask the patients to stop their existing allopathic medication immediately . Patients can take it along with the existing allopathic medicines they are taking right now. After checking their blood sugar level after 10-15 days they can slowly reduce the dosage of the existing allopathy medication they have been taking all these years and gradually can stop the allopathic medicine within a short period of time. 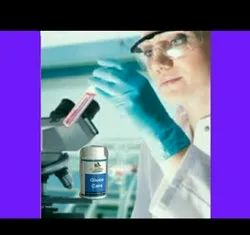 We are a renowned name in manufacturing and supplying of Antidiabetic Capsules. These are highly effective in treating Type 2 Diabetes patients. 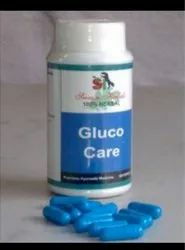 This herbal medicine is available with the name Gluco Care. Normally taken as a course for 3 months. Patients can take it along with the existing allopathic medicines they are taking right now. 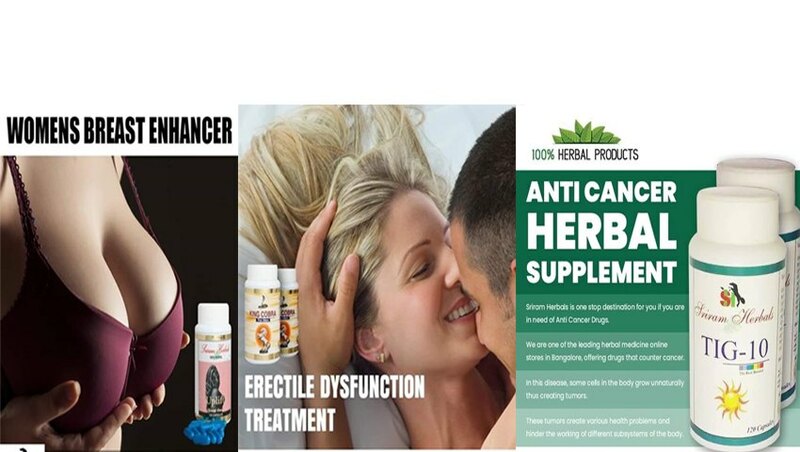 We are a leader in manufacturing and supplying of Diabetic Herbal Medicine. This herbal medicine is highly effective for treating Diabetes patients. We are a leading name in manufacturing and supplying of Blood Sugar Control Capsules. These are very effective in treating Type II Diabetes. Gymnema Sylvestre :Gymnema sylvestre, also known as Gurmar, Meshasringi and Cherukurinja, is popular as “sugar destroyer”. The leaves of the plant are dried and pounded together with coriander fruit, and then the juice is extracted to be given orally for remedying diabetes. In India, the herb is primarily being used to treat type II diabetes. Bitter Melon (Momordica charantia): Bitter melon, also known as balsam pear, bitter gourd, bitter cucumber, karela, and charantin, is cultivated widely in Asia, East Africa and South America. It has been extensively used as a folk medicine for treatment of diabetes. Several compounds contained in bitter melon are known to account for its ability to lower the levels of sugar in the blood. Pterocarpus Marsupium :Pterocarpus Marsupium, also known as Indian Kino, Malabar Kino, Pitasara, Venga, is a large deciduous tree, which commonly grows in western and southern parts of India and Sri Lanka. It has demonstrated ability to reduce the absorption of glucose from the gastrointestinal tract. It is also known to improve insulin and pro-insulin levels. Pterocarpus Marsupium, also known as Indian Kino, Malabar Kino, Pitasara, Venga, is a large deciduous tree, which commonly grows in western and southern parts of India and Sri Lanka. It has demonstrated ability to reduce the absorption of glucose from the gastrointestinal tract. It is also known to improve insulin and pro-insulin levels. 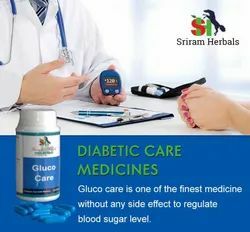 One can expect a reduction in the blood sugar level within 10-15 days by taking this and it is normally taken as a course for 3 months.Normally we don't ask the patients to stop their existing allopathic medication immediately . Patients can take it along with the existing allopathic medicines they are taking right now. After checking their blood sugar level after 10-15 days they can slowly reduce the dosage of the existing allopathy medication they have been taking all these years and gradually can stop the allopathic medicine within a short period of time. Diabetic care caps contains Gymnema sylvestre, which is a tropical herb originating in southern India, has been used for thousands of years to treat type 2 diabetes and several other medical conditions. Today, practitioners of Ayurvedic traditional medicine recommend gymnema as a treatment for high blood sugar, diabetes, high cholesterol, inflammation and obesity. Gymnema is generally regarded as safe and associated with few side effects or drug interactions. Diabetic care caps, ingredient Banaba is used as herbal medicine for the treatment of diabetes not only in India. Banaba contains corosolic acid that acts like insulin by lowering the blood sugar in the body. Corosolic acid is a triterpenoid glycoside that improves the cellular uptake of glucose. Diabetes cannot be cured completely, but can be effectively controlled. People with diabetes can lead a healthy life if, their blood glucose level is under control. The decrease in life span of a diabetic is restored to normal by maintaining good blood glucose control (90-130 mg/dl at fasting and with less than 180 mg/dl 2hrs after meals). Diabetics always need to take care of their diet and also about the food they eat. Care has to be taken because all foods contain not only carbohydrate, but also some energy value. Protein and fat available in the food are converted to glucose in the body. This glucose has some effect on the blood sugar level, which has to be taken care of. Furthermore, you needn’t have to eat only the bland boring diet . Instead, you can eat more fruits, vegetables and whole grains. All it means is that you need to select foods that are high in nutrition and low in calories. Gymnema sylvestre, also known as Gurmar, Meshasringi and Cherukurinja, is popular as “sugar destroyer”. The leaves of the plant are dried and pounded together with coriander fruit, and then the juice is extracted to be given orally for remedying diabetes. InIndia, the herb is primarily being used to treat type II diabetes.